I am chair of the board for Congo Restoration, celebrating its 10-year anniversary in 2018. As our board of directors, our founder, and I think about our next decade, we've decided to build a village school near our Congo Restoration Sewing School . • We will start construction in March and open the school in September 2019. • We will have 30 students per class — all girls, 20 paying full price, 10 on scholarship. • We will hire local women to prepare a daily lunch for our students of rice, beans, half a banana, and water. We will have proper desks and supplies. We will pay our teachers a living wage. All of these things are unheard of in village schools in DRC. We want the students to see what school should be, opening their minds to a better future for their community. • It will cost us about $8,000 to get the school open with one classroom. That’s about $6,000 for the actual classroom, as well as $2,000 for fencing, guards, and other start-up expenses. We have already raised $1,000 of that amount. • We hope the building of future classrooms will be funded by local Congolese business people who — upon seeing what we’ve started — will be interested in continuing the build-out of the school. We have good reason to believe this hope will become a reality. And with that, we ask you to support the hopes and futures of the 30 children who will be in their new classroom in one year. All funds raised with this campaign — 100%! 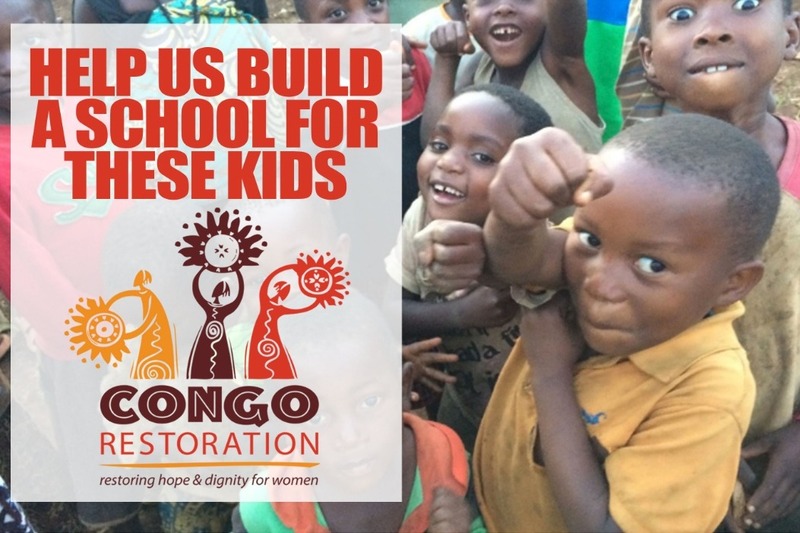 — will go directly into the Congo Restoration account and will be spent on this school. And then, the dream of an entire village to have such a school will be realized when it opens next September. We can’t wait to see that moment!